"There are plenty of journals in the field of politics, literature, especially the comely one – lots of weekly and monthly journals; different professions have their own professional journals. Only the language – this instrument of all, needed by all and unfortunately not equally valued by all, many a times treated badly and unjustly – is not able to speak for itself and has nowhere to complain", such words were written in 1901 in the first issue of "Language Aids". And it happened as the editors of the "Aids" wanted, this "small monthly journal" filled and is still filling this missing gap in the field of linguistics for 100 years now. Like the editors of the "Language Aids", today Polish bohemists are convinced that in Poland we lack the journal which would aim at discussions over the issues of bohemistic which are being worked on not only in Czech Republic but also abroad. Beginning publishing the new Slavic journal, despite the unfavorable conditions, I am utterly convinced that I am fulfilling the needs of all interested in the subject. The new journal is called "Bohemistic", and is being published by the Institute of Slavic Philologie in Adam Mickiewicz University in Poznań. This periodical will come out four times a year. What will "Bohemistic" be? Most of all it will be a complete and reliable set of information and, as I hope, an effective help for all bohemists, primarily in Poland. For this purpose it will be a means of exchange of thoughts, doubts, and also experience, a means which will make all the readers familiar with what has been done so far, inform about all conferences that are being organized etc. Hopefully it will be the best possible media of bohemistic thought and information. 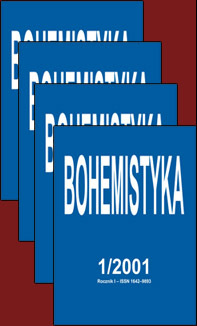 The paradigm of "Bohemistic" were journals like "Nase řeč" ("Our Matter"), "Česká literatura" ("Czech Literature") and "Český jazyk a literatura" ("Czech Literature and Language"), from which I have also taken the journal's structure and its format. 1. Scientific section, with information on current scientific-research output in the field of bohemistic, and with articles on Czech literary studies and linguistics, together with comparative works. 2. Review and report section with information concerning books on bohemistic that appear on the Czech, Polish and world market. It will surely help the readers with being up-to-date with all novelties. For this purpose we will also supplement the journal with critical review of what is going on in the publishing market, the reviews of the novelties and reports on scientific researches. 3. Annalistic section in which I would like to include complete and useful information concerning bohemistic centers in the world, jubilees of Czech and world bohemists, scientific conferences devoted to the issues of Czech literature and language etc. This section will also run the reports from conferences, articles on anniversaries and jubilees of Polish and world bohemists, and also reports on bohemistic institutions and organizations all over the world. Whether this aims be realized or not does not depend solely on me or the editorial staff. We should all join in editing of "Bohemistic", so the issue may be popularized properly. The value of this periodical will depend also on our harmonious and well planned cooperation. That is why I ask all of you not to be the readers only, but to become co-authors. I do not mean to impose the form of this cooperation on anyone. Each and every comment, an article, a review, a report, any kind of information will be of great importance and meaning to the nature of the journal. Thanks to your cooperation it will not be just a still print, but a living word, that will build a bridge between bohemists and bohemistic centers in Czech Republic and abroad. "Bohemistic" is open to all of you who wish to cooperate with us.